Police are appealing for help to find a man known as Deadly, who is wanted in connection with a serious assault. 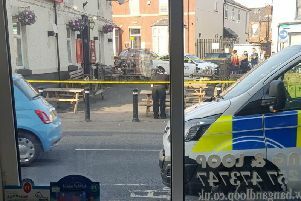 A 23-year-old man was punched in an alleyway behind the Springfield pub in Coppull at around 12.05am on May 5. He hit his head on the ground and was taken to hospital with a bleed on the brain. Police now want to speak to 29-year-old Raymond Scott Jones, known as Deadly, who has links to Wigan, Chorley and Preston. They said he is disqualified from driving but has access to two cars - a silver Nissan Qashqai, registration PN64 YXY, and a silver Vauxhall Vectra, registration KS06 HWN. “We believe he left the country following the attack and has recently returned. He could be in the Wigan area. Anyone who has seen Jones or knows where he is can call police on 01257 246250 or 01257 246190, quoting crime reference SC1803877. Alternatively, email police at 3439@lancashire.pnn.police.uk or call charity Crimestoppers, anonymously, on 0800 555 111.